Identifying the genetic etiology for retinal disorders is challenging because of allelic, phenotypic, and locus heterogeneity, as well as environmental toxicities resulting in phenocopies. Patients often endure long diagnostic odysseys involving many single gene and/or gene panel tests. Whole exome sequencing (WES) is a highly appealing alternative to panels, which require frequent revision as new causative genes are discovered; however, incomplete coverage of relevant genes means standard WES is also non-ideal. 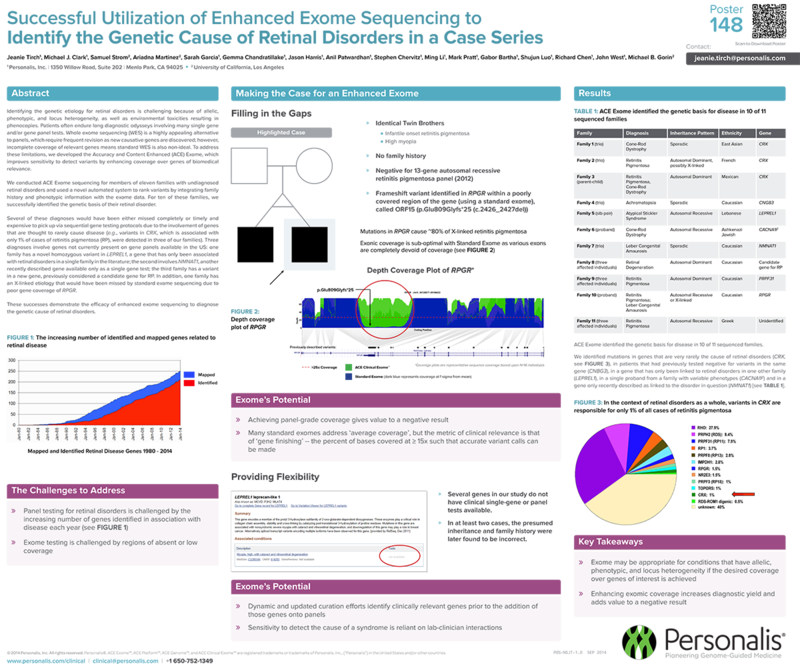 To address these limitations, we developed the Accuracy and Content Enhanced (ACE) Exome, which improves sensitivity to detect variants by enhancing coverage over genes of biomedical relevance. We conducted ACE Exome sequencing for members of eleven families with undiagnosed retinal disorders and used a novel automated system to rank variants by integrating family history and phenotypic information with the exome data. For ten of these families, we successfully identified the genetic basis of their retinal disorder. Several of these diagnoses would have been either missed completely or timely and expensive to pick up via sequential gene testing protocols due to the involvement of genes that are thought to rarely cause disease (e.g., variants in CRX, which is associated with only 1% of cases of retinitis pigmentosa (RP), were detected in three of our families). Three diagnoses involve genes not currently present on gene panels available in the US: one family has a novel homozygous variant in LEPREL1, a gene that has only been associated with retinal disorders in a single family in the literature; the second involves NMNAT1, another recently described gene available only as a single gene test; the third family has a variant in a new gene, previously considered a candidate gene for RP. In addition, one family has an X-linked etiology that would have been missed by standard exome sequencing due to poor gene coverage of RPGR. These successes demonstrate the efficacy of enhanced exome sequencing to diagnose the genetic cause of retinal disorders.